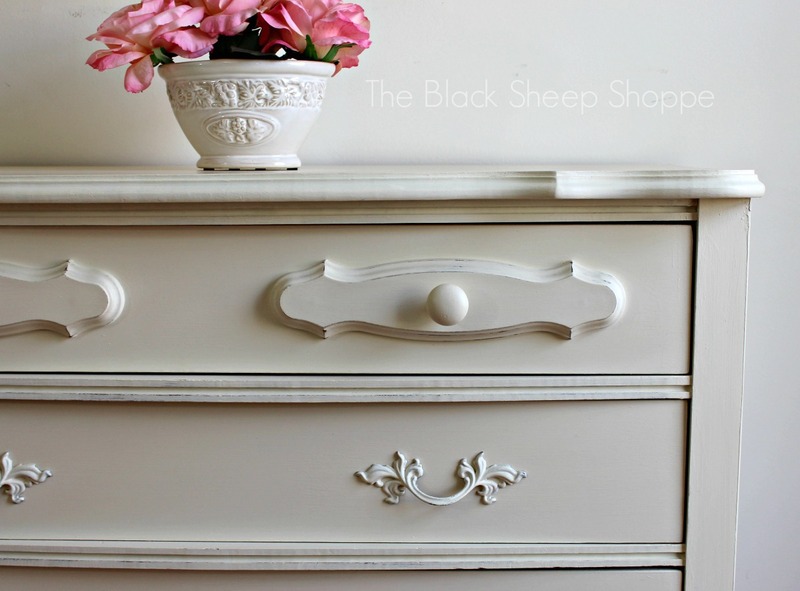 Today's project is a vintage Sears Bonnet dresser which was popular in the 1970s. I remember as a little girl a couple of my friends had the set and I was quite envious. So when I spotted this one at a local thrift store I snatched it up. There was also a matching desk, but it was a little worse for wear, so I passed on the desk. 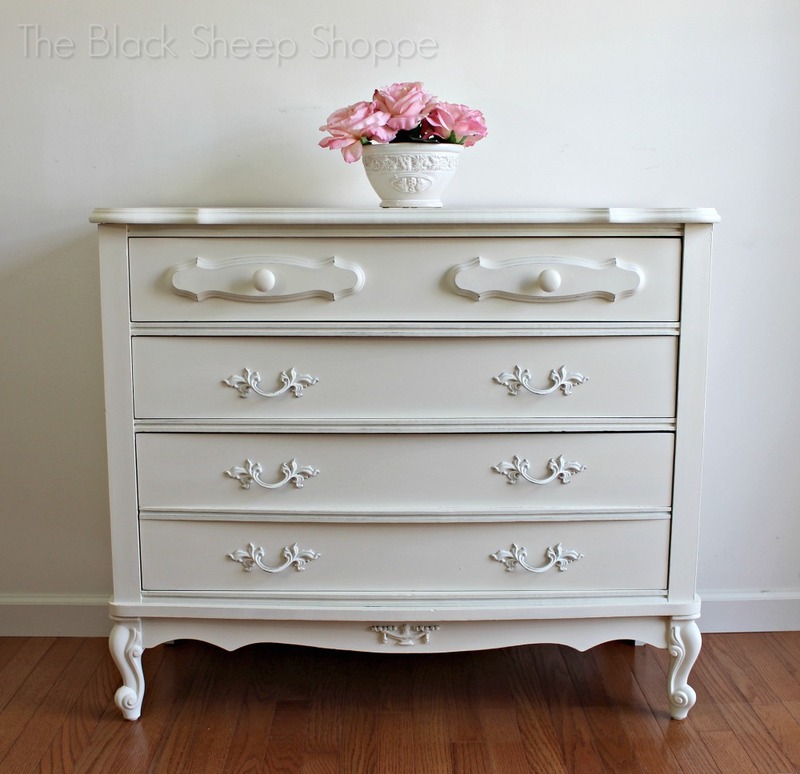 The piece I purchased is a 3-drawer chest. It also has a coordinating mirror which attaches to the back with metal hardware. I didn't like the attachment hardware, so I took it off and replaced it with d-hooks so the mirror can be hung on a wall instead. 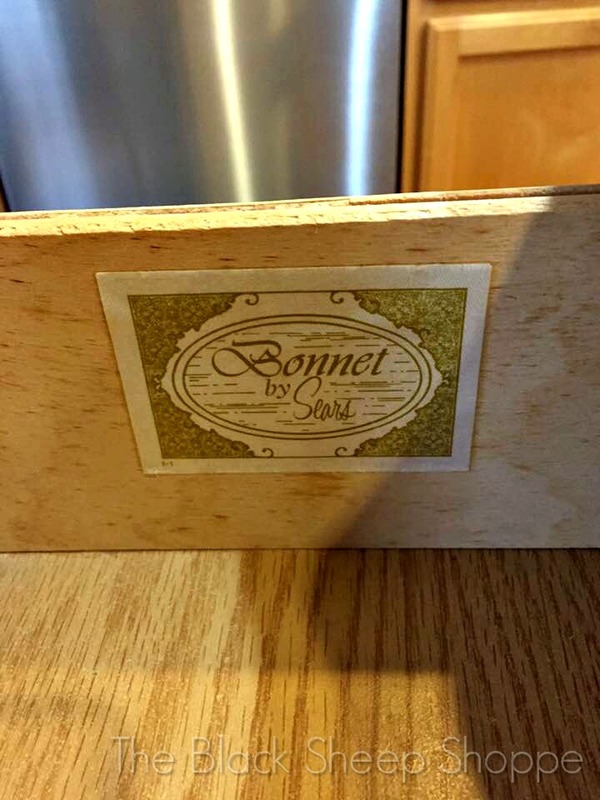 Sears Bonnet label inside drawer. 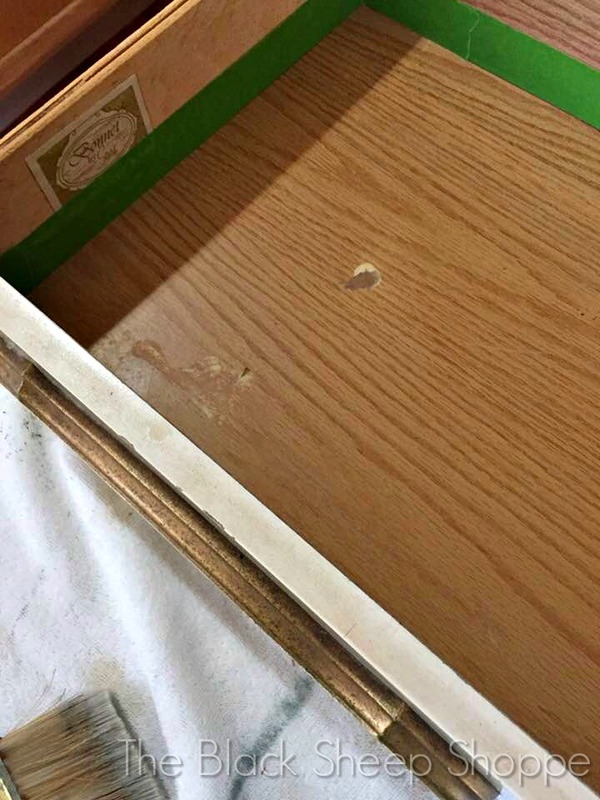 Overall the finish was in good condition, but there was some surface damage inside the top drawer. 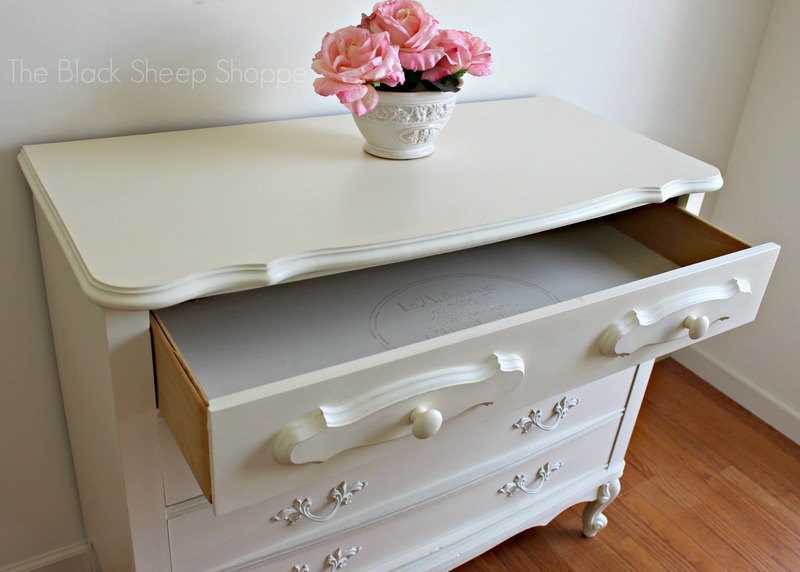 I decided to go ahead and paint the top drawer, but left the other drawers with their original finish. I really love the beautiful hardware. It's so pretty and feminine. 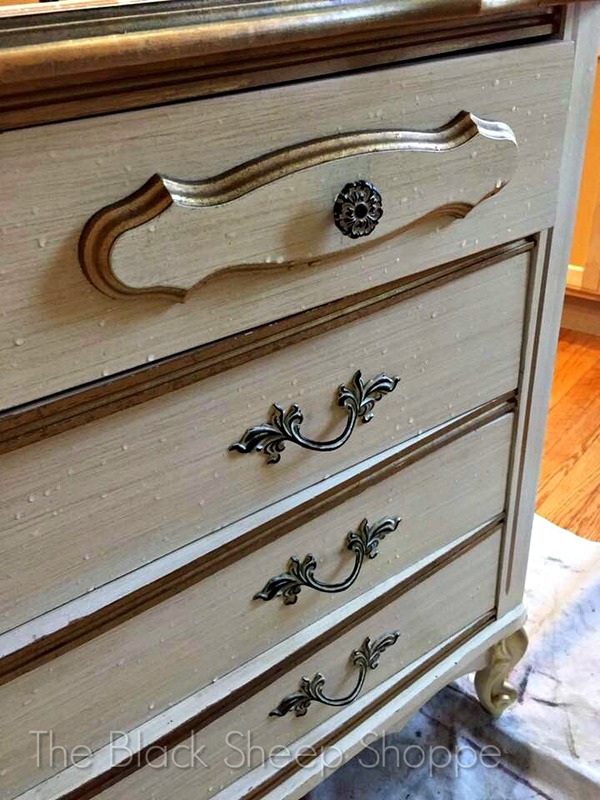 Unfortunately, it was missing one of the top drawer knobs. So I took a couple of extra knobs that I had on hand and painted them to match the new finish. The front legs are cabriole-style and are made of a molded plastic with gold painted highlights. I'm sure it was very fashionable in its day, but I planned to paint it to give it a more elegant finish. Although it's a plastic material it is quite sturdy. 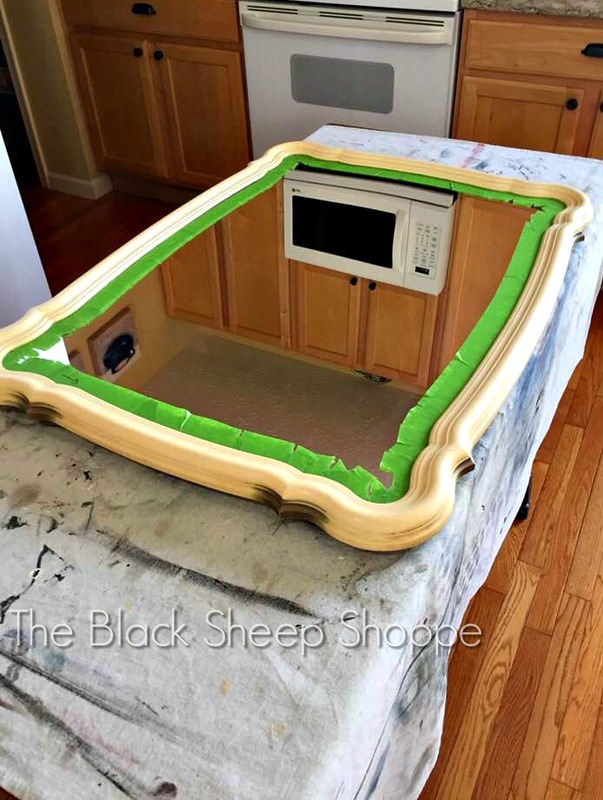 After the Chalk Paint is applied it will no longer have the feel of plastic. 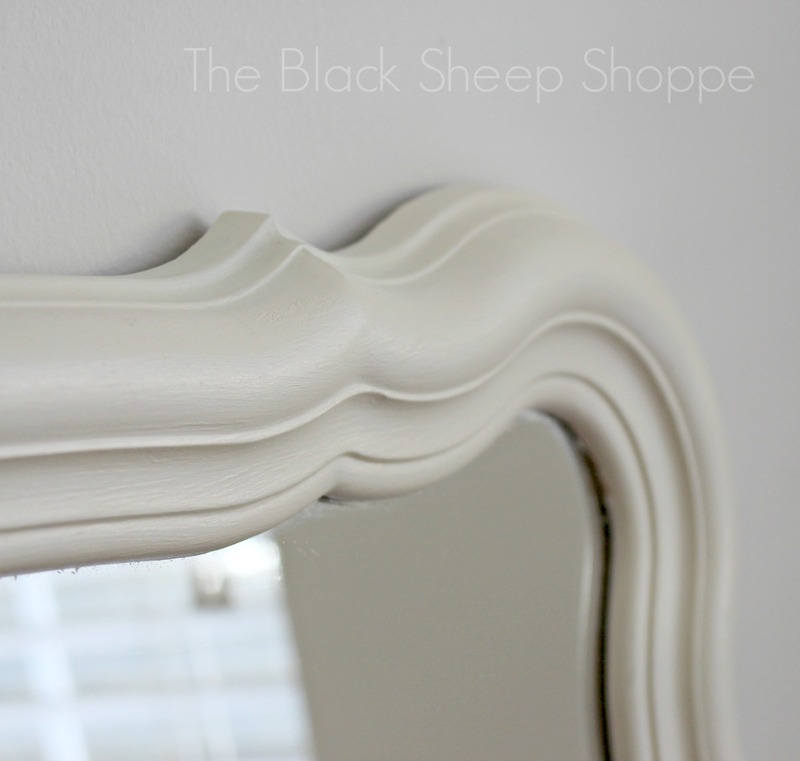 The mirror frame is made of the same molded plastic. The top of the dresser is laminated. It's super smooth and shiny and has held up well through the years. 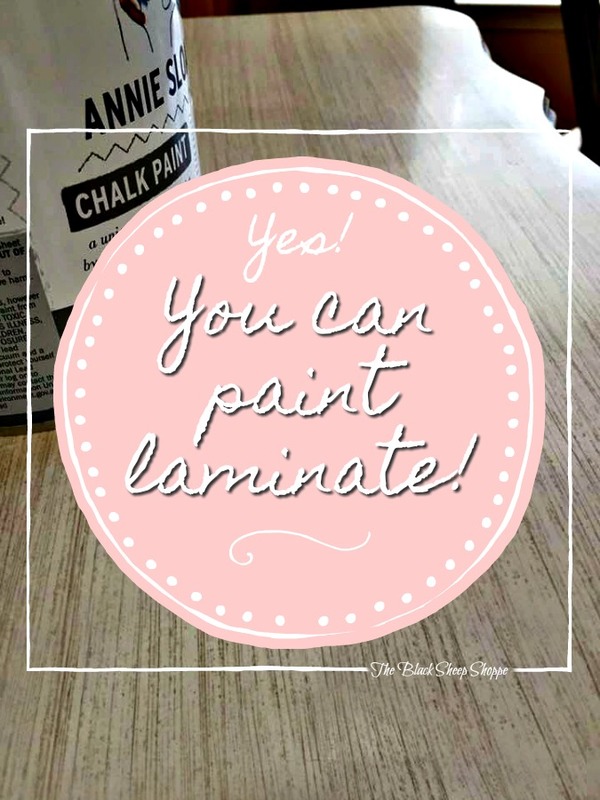 One question I am asked a lot about is whether or not you can paint laminate. 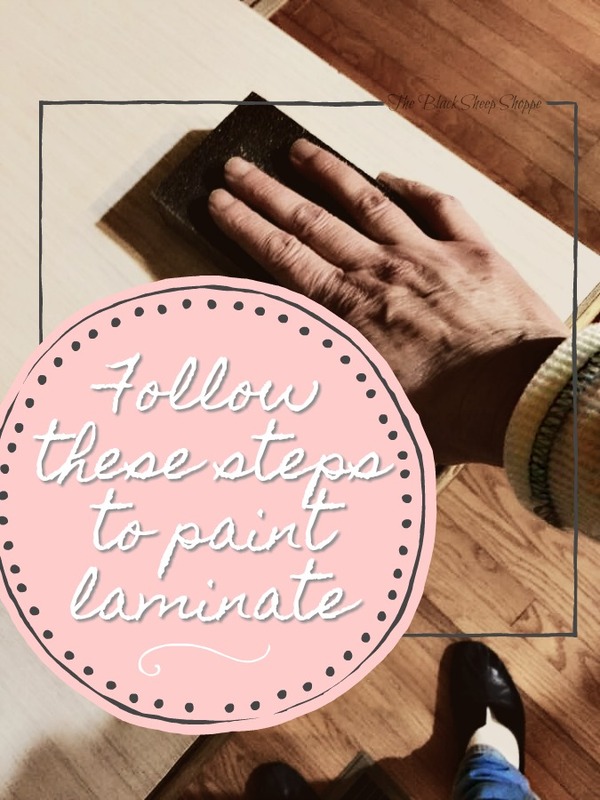 And the answer is, "Yes, you can paint laminate". The good news is that it is quite easy to paint laminate! 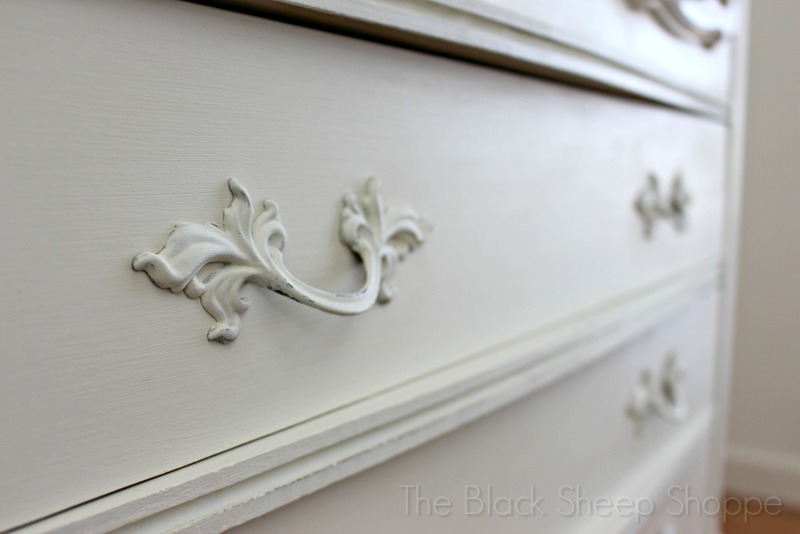 Annie Sloan Chalk Paint works especially well on both the laminate and molded plastic. 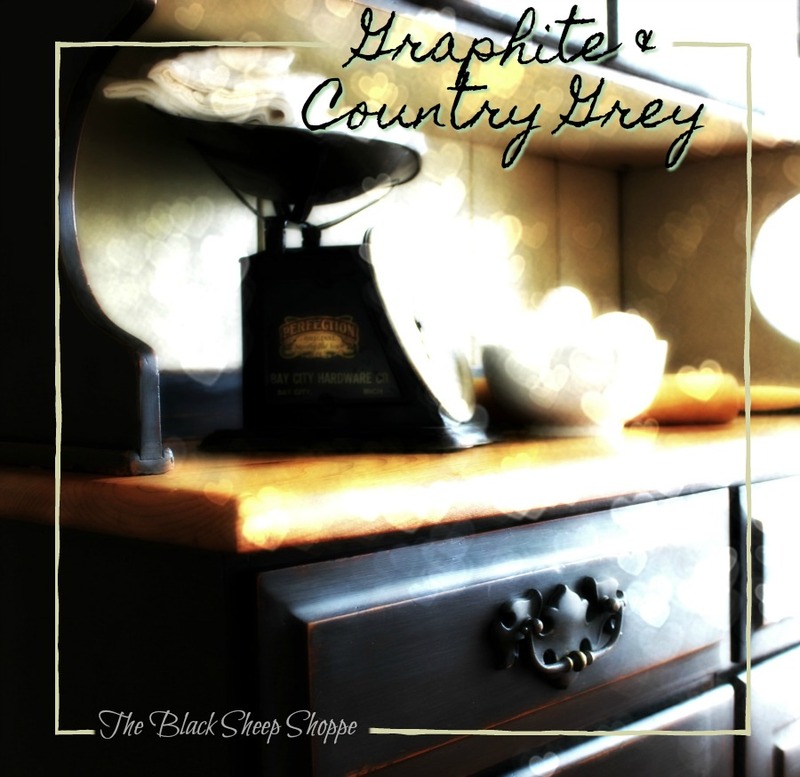 (For your convenience, affiliate links are included for the supplies mentioned in this article. It doesn't cost you extra.) 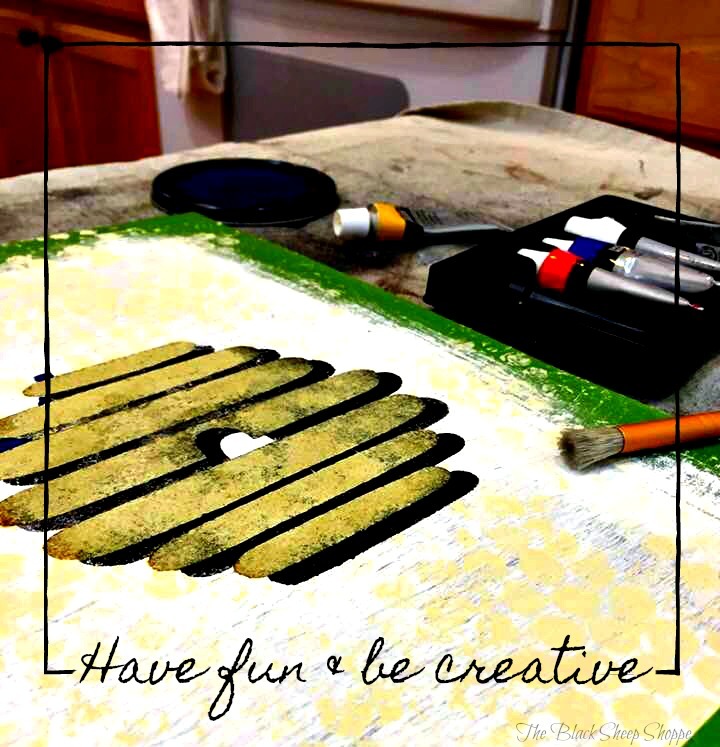 If you're using a paint other than the original chalk paint, then check the manufacturer's instructions to see if you need a primer coat first. However there are a few tricks to making sure you get good adhesion using this product. The first is to make sure the surface is clean and free of dirt and oils. 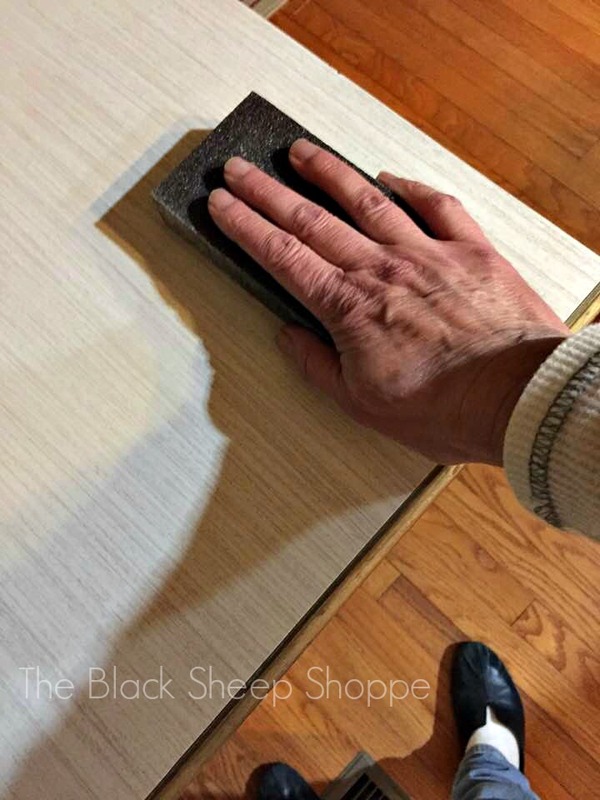 Then lightly sand the top with a sanding block. 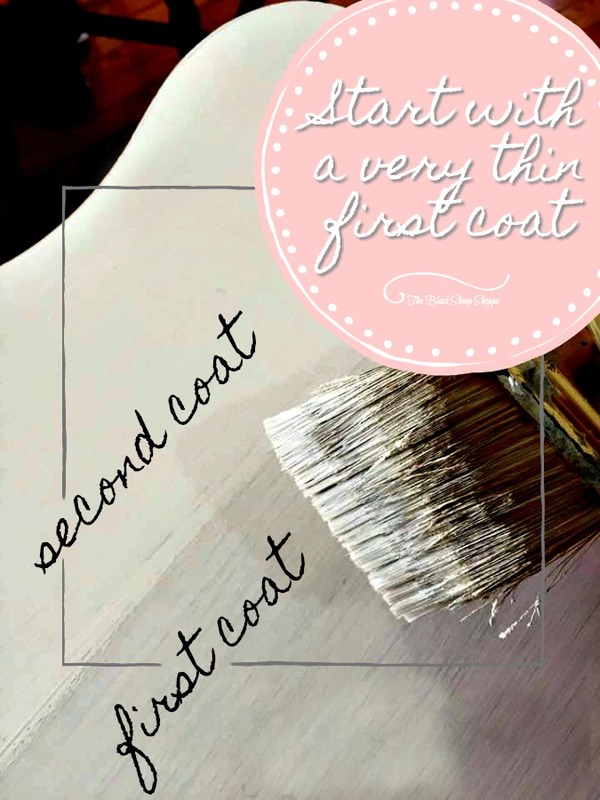 Start the painting process with a very light and thin first coat. 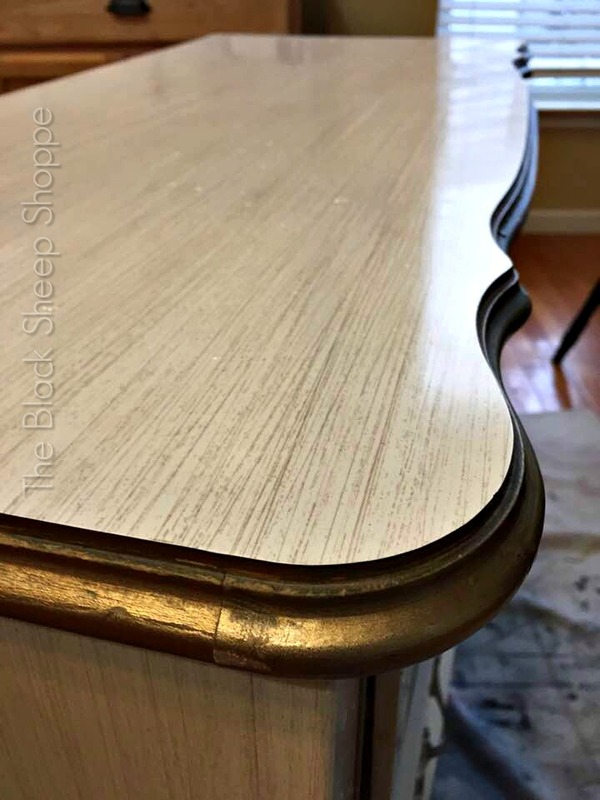 It will stick to the shiny surface, and the thin first coat will provide just enough texture for the second coat to adhere to. 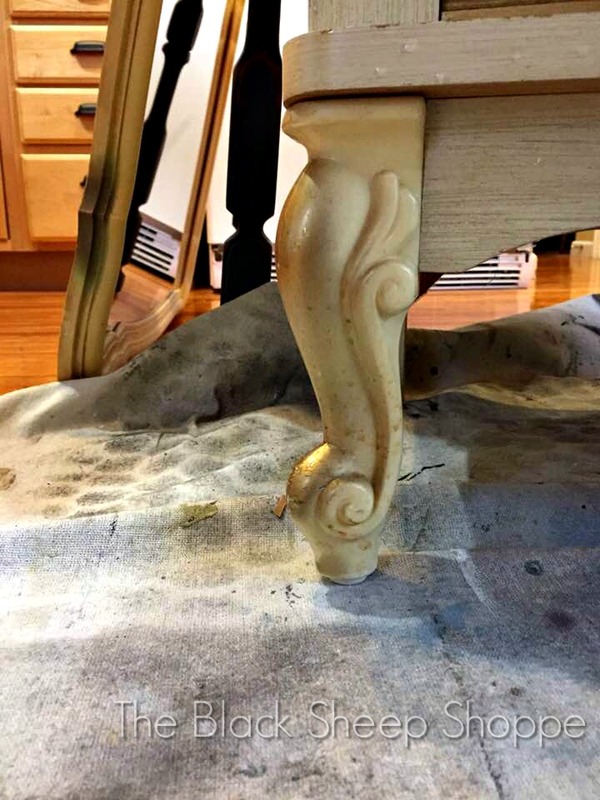 Add a third coat if necessary and then seal with clear wax. The photo below illustrates the difference between the coverage on my first and second coat. 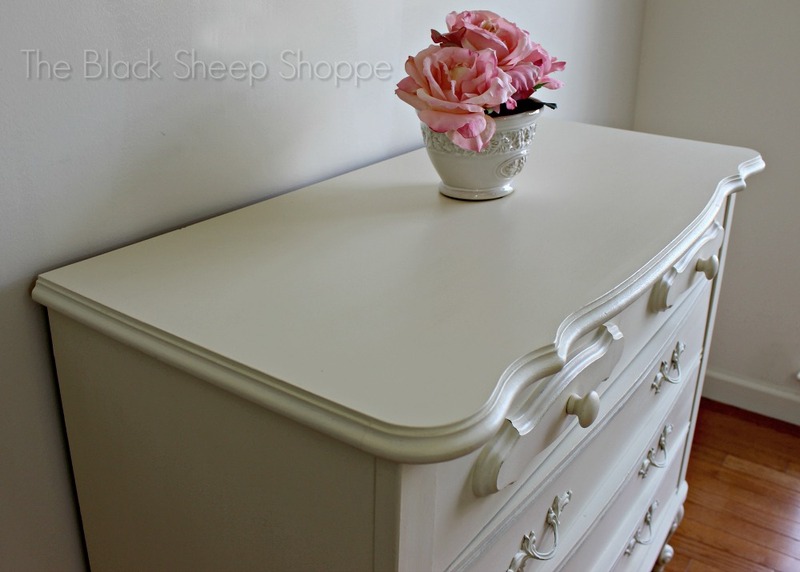 The all white color scheme gives this piece a very classic and elegant look. Using a slightly damp washcloth, I added just the lightest hints of distressing around the knobs and drawer fronts. The painted laminate top turned out very well with excellent adhesion. Here are the two replacement knobs that I painted. 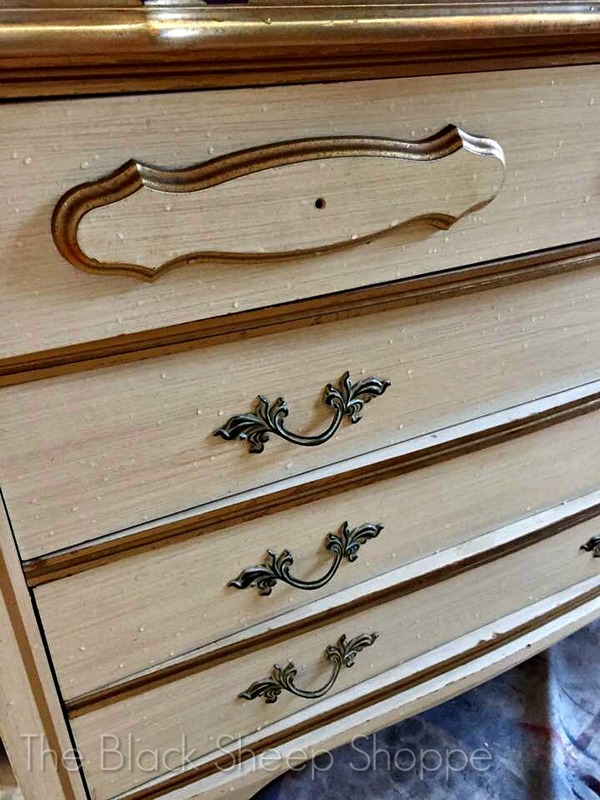 I initially planned to keep the bottom drawer pulls with their original finish. 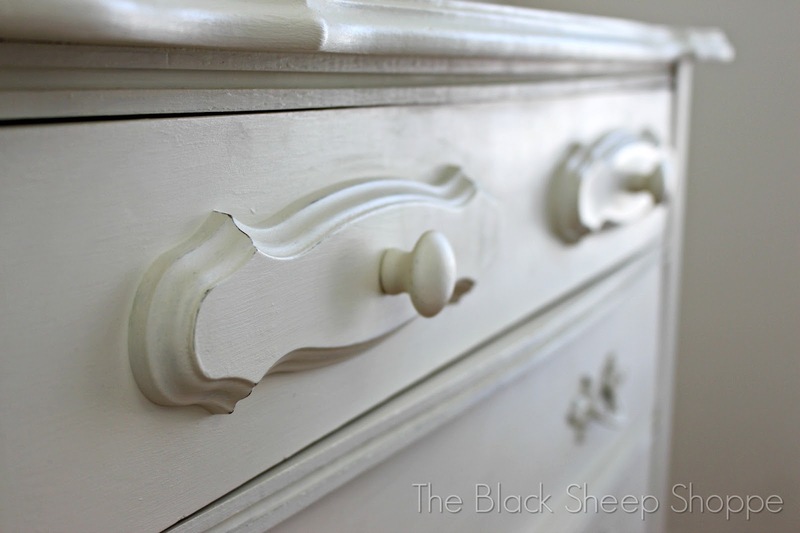 But after I painted the dresser the pulls looked dingy, so I gave them a couple of light coats of paint. 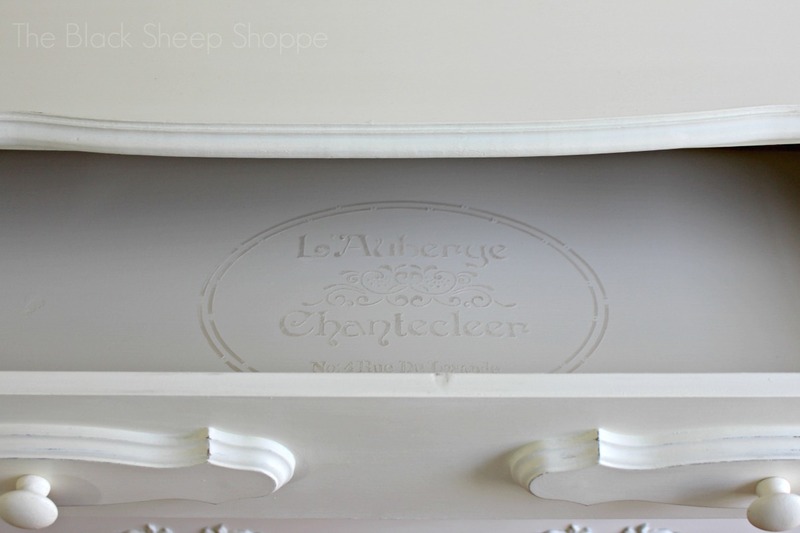 After I painted the interior of the top drawer, I thought it needed a little something more, so I added a French stencil. 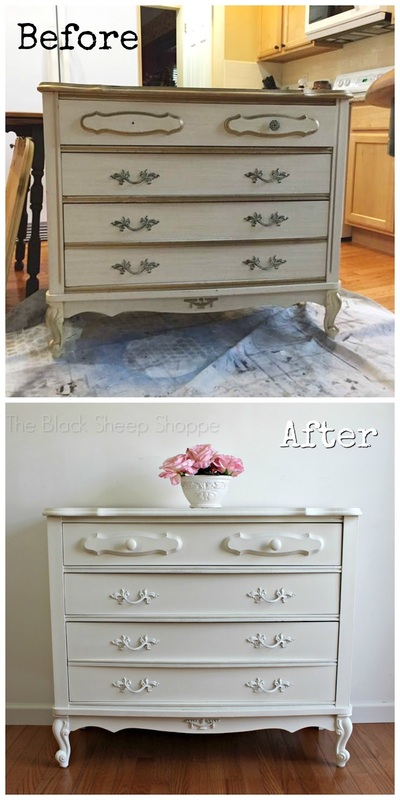 The stencil is subtle and works nicely with the overall classic look of the dresser. 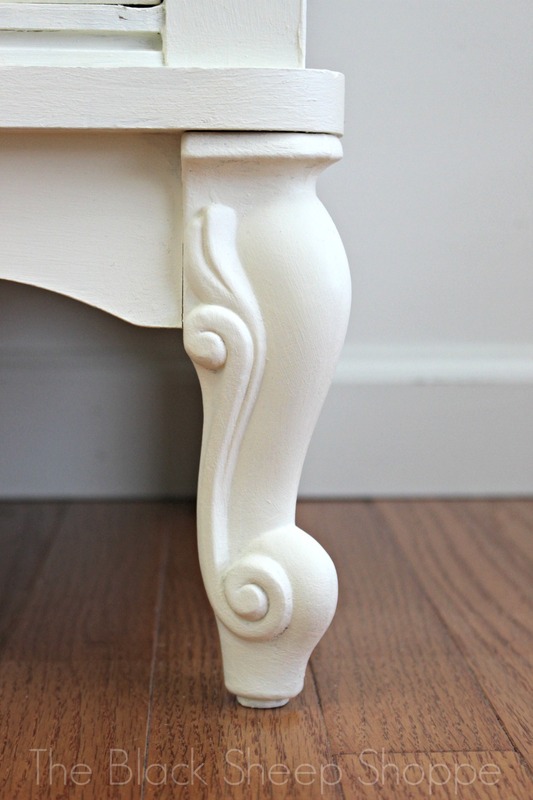 The painted front legs are subtle yet still quite elegant. As I mentioned earlier, I decided to switch the mirror to a wall mount. 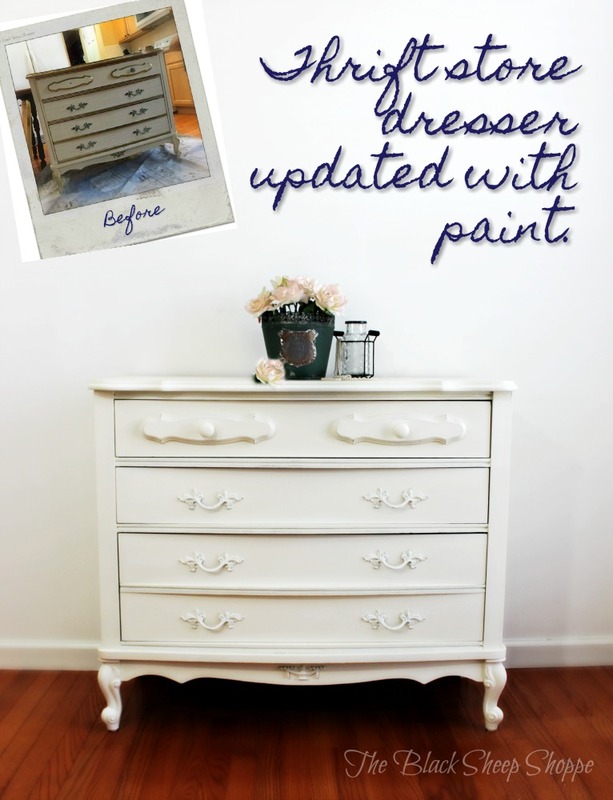 The dresser works well with or without the mirror, so I will list them for sale separately. 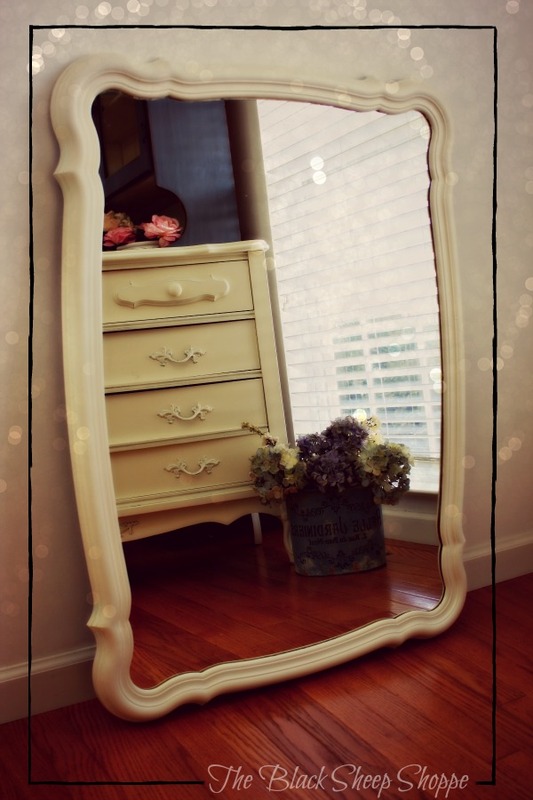 Here's a closer look at the painted mirror frame. I think the all white finish works beautifully with this style. And finally, here are a few before and after comparison photos. 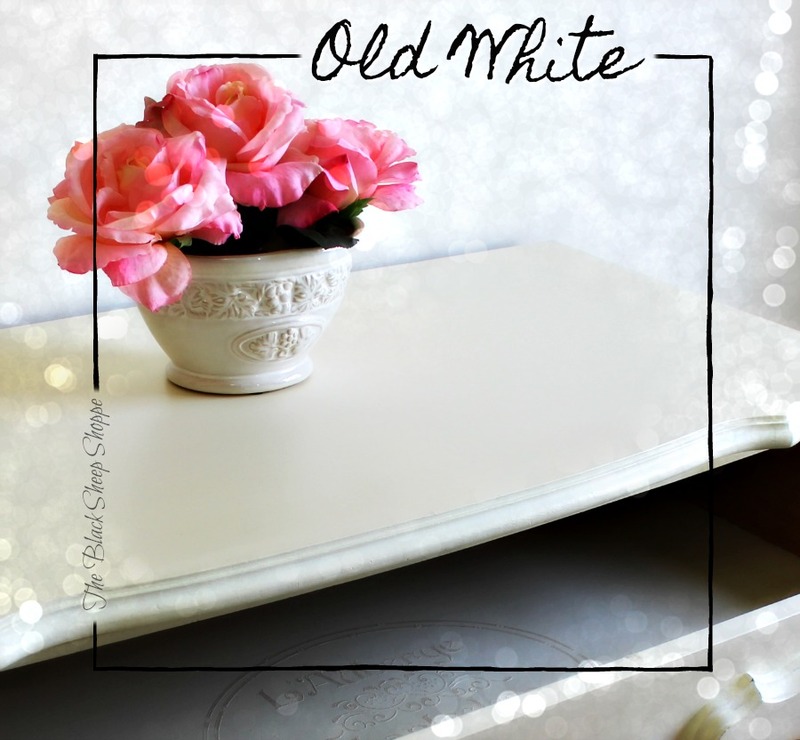 These are good examples of how you can take dated thrift store finds or hand-me-down furniture and turn it into something new and beautiful. Absolutely stunnin! I am so in love with what you've done to all of these pieces. Thanks so much Ivory Jean! I really appreciate your kind words and encouragement. Me too, Patricia - my cousin had this set growing up and I was so envious. 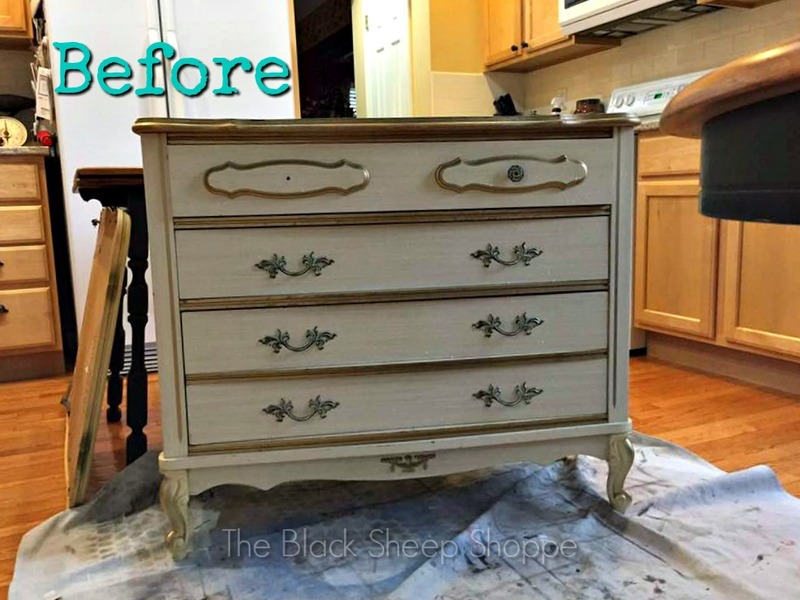 Very nice makeover! Thanks Marie! It seems everyone except you an me had the set, ha ha. 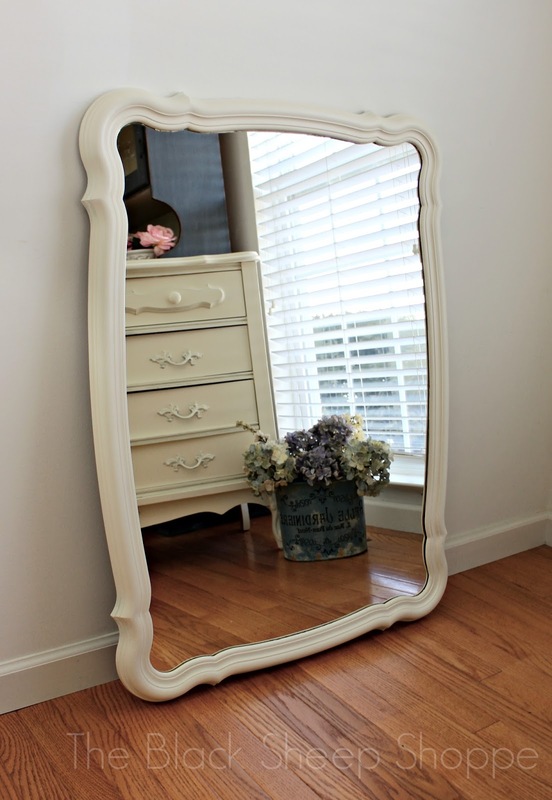 I just picked up one of these mirrors at a yard sale this morning-- $10! 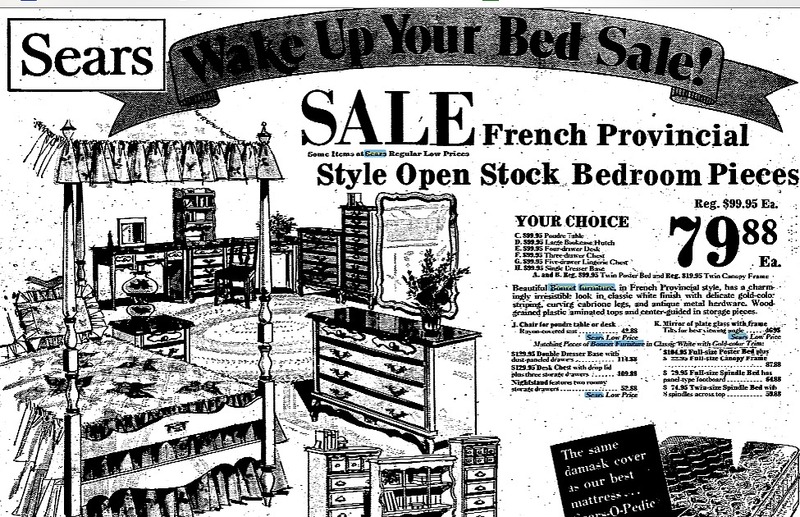 I can't say for sure, but the canopy bed I had as a child may have been from this set as well. 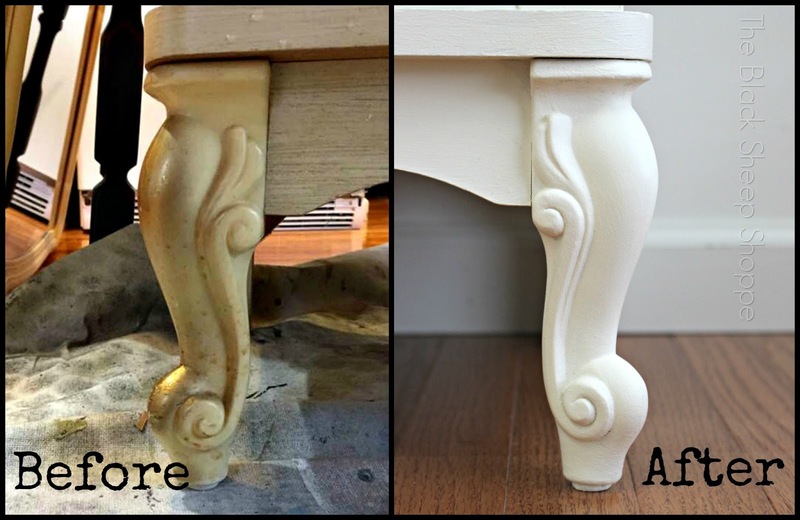 Thanks for the painting tip-- I'm looking forward to giving mine a makeover! Did you take the hardware off to paint them? Or you just left them on? I took the hardware off and painted it. This is beautiful! Was this done in Old White by Annie Sloan? Thank you. Hi, any chance you still have the original knob and willing to sell it? Hi Elle, I checked through my stash and didn't find the knob. But I'm fairly certain it's around here somewhere. If I come across it then I will let you know. You're lucky to have a full set Susie! I bet it will turn out beautiful and would love to hear about it afterwards.